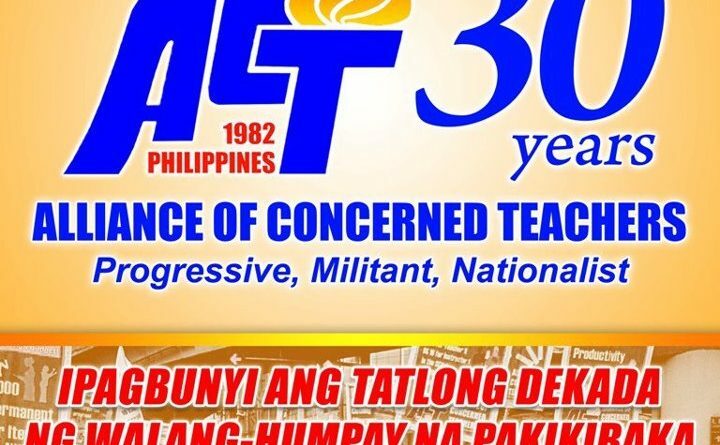 The International Coordinating Committee and entirety of the International League of Peoples´ Struggle (ILPS) share the joy of ILPS member-organization Alliance of Concerned Teachers (ACT) in celebrating its 30th founding anniversary with a year-long schedule of activities, starting from June 26. We convey warmest greetings of solidarity to the entire alliance, to the delegates and guests as you hold your 13th Congress to celebrate three decades of relentless struggle for the rights and welfare of teachers, education workers and the entire Filipino people. Your alliance was founded in defiance of the Marcos fascist dictatorship in 1982 and soon enough you became militantly involved in the broad mass movement to overthrow the dictatorship from 1983 to 1986. Since your founding, you have stood firmly and acted vigorously in the interest of teachers and education workers as well as in the interest of all the people. We applaud you for steadfastly opposing the control and manipulation of the educational system by the imperialists and local reactionaries to serve their narrow interests. One reactionary regime after another has deprived the education sector of sufficient resources to keep up with the needs of the teachers and students and has allowed US and other foreign or multilateral agencies to provide grants and loans and dictate educational policy and the content of the curricula. Your sectoral interest is a matter of public interest. You provide a vital social service, without which the Filipino nation cannot endure and develop further. Your educational work can only be as good and effective as it serves the need of the people for national independence and democracy and you advance a patriotic, scientific and mass-oriented kind of education. We salute you for your great success in uniting teachers and other education workers to struggle for their democratic rights and welfare. The work of unionizing them has been outstandingly fruitful. Your alliance now stands as the strongest patriotic, progressive and militant organization of teachers and non-teaching personnel at the preschool, elementary, secondary and tertiary levels in both public and private institutions. We commend you for your position that the role of ACT as a whole, your affiliate organizations (National Federation of Teachers and Employees Unions and the Congress of Teachers for Nationalism and Democracy), the respective members of each formation and all those in the education sector is not only to teach or propagate what is to be done but also to participate in the process of social transformation. We commend your initiatives in carrying out campaigns and activities to advance national independence and democracy, support land reform and national industrialization, defend human rights, protect the environment and support the national minorities/indigenous peoples, promote gender equality and take up all important social issues. The crisis of the world capitalist system and the domestic ruling system is protracting and worsening. It is escalating the exploitation and oppression of the broad masses of the people, their schoolgoing children, the teaching and non-teaching personnel of educational institutions. The current US-directed Aquino regime would rather increase spending for the reactionary armed forces and Oplan Bayanihan than for such vital social services as education, health and housing for those with low income. We admire your resolve and militancy in demanding real socio-economic development and improvement of the educational system, the allocation of more resources to education now, and immediately enable the children and youth to have adequate and better education. For the educational system to run better, the teaching and nonteaching personnel must be provided with decent and better compensation, more classrooms, chairs, chalks and teaching aids. We condemn the Aquino regime for pretending to improve the educational system with the so-called K to 12 program of basic education, and yet it does not provide enough resources for the necessary increase of teachers, classrooms, chairs and other necessities. Under these conditions, the educational system and the general performance of students will further deteriorate. The real objective of the regime is to produce more cheap labor for deployment abroad and separation from their families. It is reprehensible that the regime boasts of giving compensation and incentives to teachers on the basis of performance but in fact brings down the rate of salary increases far below the inflation rate of basic commodities and bans even existing bonuses which have augmented the low and inadequate salaries for teachers. The regime is also discouraging entry to the teaching profession by perpetuating low salary scales and whipping up job insecurity through contractualization. You must continue to fight vigorously for your sector and conjoin your strength with that of all the oppressed classes and sectors of Philippine society in order to build national unity for social transformation. And you must unite with all your fellow teachers abroad and celebrate with them World Teachers Day on October 5. You must seek the solidarity of the progressive forces and movements abroad that have a common cause with you in realizing the aspirations for national and social liberation, democracy, all-round development, social justice and international solidarity peace. I am proud to be a teacher and I am always concerned with upholding, defending and promoting the rights of teachers and other personnel in the education sector. I have functioned best as a teacher in the classroom as well as outside of it, in the Philippines and abroad. I am highly honored by the ACT in considering me as one who has made a certain measure of contribution to the struggle for the cause of the teachers, education workers and the Filipino people in general. I accept the award and I am deeply grateful for the honor.